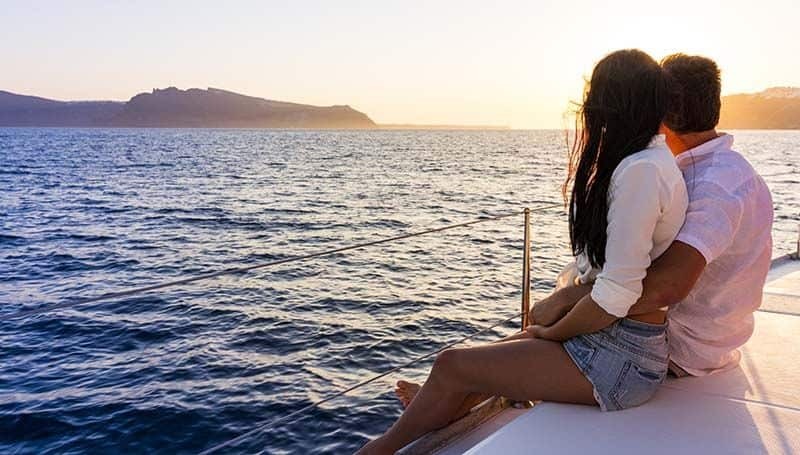 There are many reasons to take your special someone out on the water for a romantic yacht charter. We have done several of each type of the charters described below, so let us help plan your special cruise. Get creative! It is an event that neither you or your special someone will forget. Create Special Memories although really, anytime out on the water is a special time. Come out with us and enjoy San Diego Bay! Often these are catered and may have special appointments such as music (perhaps a solo guitar player), ring buoy for pictures, balloons, photographer etc. For charter duration, on especially catered charters, we recommend at least a 3 hour charter. We can even anchor in a quiet place, such as Glorietta Bay and perform a renewal of vows as part of your charter. It may be structured anyway you wish. We have had many future grooms that decide to get engaged and “pop the question” while on a romantic yacht charter. It is an excellent way to begin your life together. Often the lady is unaware that they are going on a yacht charter at all and is surprised when they show up at the dock. Our crew especially enjoys that excitement and surprise of these charters. The videos were shot on our 52 ft yacht. If you are wondering, the picture to the right is an actual proposal – and she did say YES! After you purchase the engagement ring why not present it to her on a private yacht? The yacht is just a lovely setting for such a special event. Sometimes it is just the couple on the yacht, sometimes it is a whole group for a party. On several occasions, we have actually hid the parents or friend on board until after the proposal. Needless to say the future bride is very surprised and it is a great story for the future children. Any day is a great day for a couple to get out on the water and share some wonderful time together. It can be an intimate cruise for just the two of you or make a party of it with family and friends. The crew will take special care and pamper you on this special event. We can arrange for any special appointments to the yacht that you desire, such as roses, catering, music etc. An event that you will always remember.